Does workers' compensation cover my injury? Is any injury caused by my employment covered by Workers' Compensation? Does my injury have to occur at work to be covered by Workers' Compensation? When should I notify my employer of the injury? When do I have to file a claim? If I re-injure or irritate a previous injury or condition, am I still eligible to receive benefits? What benefits am I eligible for under the workers' compensation law? Will my benefits be taxed? Can I receive benefits if my injury was caused by someone other than my employer or my co-worker? Can I settle my case? What happens if I settle? What happens if my employer offers a settlement and I choose not to accept it? Should I be seen by my employer's doctor? 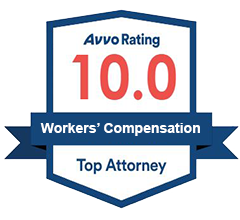 How much does a good workers' compensation attorney cost? If I'm permanently disabled, can I receive benefits in a lump sum? How can I ensure that I will receive future medical treatment for my work related injury? If my employer or their workers' compensation insurance company asks me for a recorded statement, should I provide one? Should an accident report be filled out with your employer? Yes, if your injury or illness arose out of and in the course of your employment. Exceptions: Most states have developed exceptions to the exclusiveness of the workers' compensation remedy in extreme situations. When employers act in bad faith or intentionally or criminally harm employees, many states allow workers to bring lawsuits against their employers outside the workers' compensation system. A lawsuit against a third party may also be possible, such as against a manufacturer of faulty equipment that causes an injury. In such circumstances, the employer may be able to get reimbursement for workers' compensation benefits already paid. If the injured person is guilty of serious and willful misconduct, the injury may not be covered. However, most injuries that occur due to employment, including those accidentally caused by the injured employee and disabilities such as carpal tunnel syndrome and tendonitis that are caused by repetitive actions are covered. No, but it has to be caused by your employment. Usually injuries while traveling to and from work are not covered, but those that occur while attending work-related functions and business trips are covered. As soon as possible but no later than 45 days after the accident to be compensible. As close to the accident as possible, but no later than 90 days after the accident. The deadline to file a Workers' Compensation claim is called the Statute of Limitations. In Illinois, the claim must be filed within three years from the day the injury occurred, or within two years of the date the employee received their last Workers' Compensation Benefits, whichever is later. For a repetitive trauma, dates will vary. Contact Mevorah Law Offices LLC for assistance. Vocational rehabilitation, job training or schooling if your employment is unable to accommodate your permanent work restrictions. Illinois, like most states, does not tax workers' compensation benefits, nor does the federal government. Yes, a workers' compensation case can be settled. Negotiation between the injured employee or his/her attorney and the insurance company determines the parameters of the settlement. Generally, all rights to any further compensation for this specific injury are waived. You can take your case to an arbitration hearing, where all evidence will be heard by an arbitrator. Either party can choose to appeal the decision made. It is most likely in your best interest to choose your own doctor, rather than leaving medical control to your employer and their insurance company. The attorney's fee is based on a contingent fee. This means that instead of an hourly charge, the attorney will be paid a percentage of the client's compensation, and will only be paid if the client receives benefits. In Illinois, the attorney can charge up to 20%. 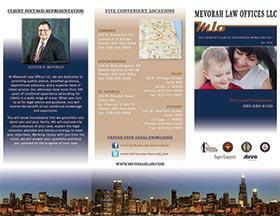 Consult Mevorah Law Offices LLC for details. Instead of scheduled payments, you may receive benefits as a lump-sum, as long as both parties agree and it is approved by the Illinois Workers' Compensation Commission. The only way to guarantee that you will receive future medical treatment is to have a hearing before an arbitrator at the Illinois Workers' Compensation Commission. If you settle with your employer or ask for a lump sum, you close out your right for further paid medical treatment unless it states otherwise in the settlement contract. No. You may unintentionally say something that could jeopardize your right to recover benefits or drastically limit the benefits you are entitled to. Call and make an appointment with Mevorah Law Offices LLC as soon as possible after your injury so we may assist you in obtaining the maximum benefits you are entitled to under law. Yes. Make sure that all information is accurate before you sign it and request a copy of it from your employer right after it is made. Contact Mevorah Law Offices LLC for further information about your Workers' Compensation case!